This two-phase project is already exploring promising models of nursing education and practice related to improving population health. The U.S. outspends every country on health care, yet its residents have shorter lives and poorer health. The country also has in nursing a real solution: The largest health profession is also the one that Americans trust the most, and is woven into the fabric of the community in ways other health practitioners are not. In 2017, seeking to understand how best to match America’s great resource to its increasingly complex health problems, the Robert Wood Johnson Foundation produced Catalysts for Change: Harnessing the Power of Nurses to Build Population Health in the 21st Century. That report saw that, for people to thrive, nursing and health care should consider environment and community in assessing the health of individuals and families. The report has also led to a follow-up effort: Population Health in Nursing, or PHIN. PHIN phase 1, carried out in 2018, describes promising educational models to prepare nurses, across all levels of professional practice, for population health practice and leadership. 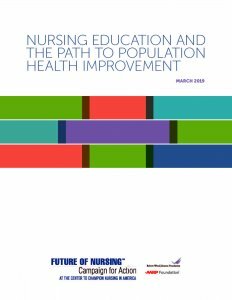 To read its findings, read Nursing Education and the Path to Population Health Improvement. PHIN Phase 2 will describe current and emerging nursing roles in population health practice and how nurses should be prepared for these roles. PHIN Phase 2 began in February 2019. The findings will be released in early 2020. Read the PHIN Phase 1 report.